Picture from wicklore : Where Bonar practised his art? Picture: Where Bonar practised his art? Carnearny’s summit once boasted fine views across Lough Neagh and to the Mountains of Mourne and the Sperrins. Those views would need to be sought on the approach to the hill, as the summit itself is now mostly covered in forestry. 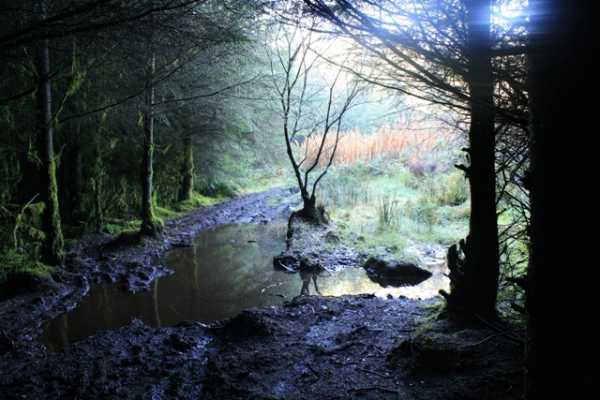 As well as smothering the views, the forestry provides excitement to quad bikers, scramblers and mountain bikers who have churned up the trails leading to the summit. However there is an area on its western slope where forest clearance allows views out to the west. By parking at the forestry entrance at 17692, you can ramble along forest tracks to the cleared area to the west. A track leads past a telecommunications mast to the small summit clearing, where a trig pillar sits amongst the vegetation. Alternatively from the forest entrance you can head directly to the summit through the trees where you will soon join a churned up trail to the summit. The return trip could be as little as 30 minutes, with little to promote a longer stay unless you ramble along the forest tracks. For those travelling from further afield, Carnearney can easily be included in a spate of individual hill climbs in Antrim.